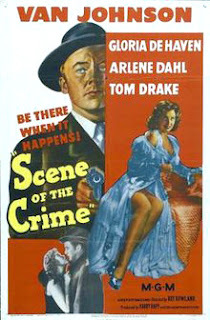 This movie’s title, and the opening sequence, seen behind the credits, suggest that Scene of the Crime deals largely with forensic science. In fact, it’s the story of an old-fashioned police investigation, with plenty of leg-work, questions and background-checking. While that may sound dull, the story the inquiry uncovers by simple, dogged detective work is complicated and hard-boiled. Not a film noir, Scene of the Crime is in instead an interesting and involving police-procedural - though you may lose track of who is doing what to whom at some point. Van Johnson heads the cast as the lead investigator, with John McIntire as his aging partner. 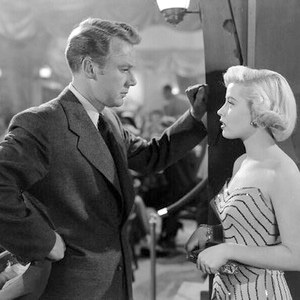 (McIntire always seemed to look old in films; though only forty-two at the time of this one, he appeared and acted older.) Tom Drake is the new detective on the team. The two leading ladies (Arlene Dahl and Gloria DeHaven) share about equal time on screen, and DeHaven, in particular, gets to show her talent. The writing appealed to me most about Scene of the Crime. The script made much of the different characters. Each is quite distinct from the others, whether cop or crook. 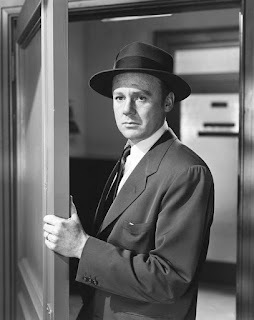 There is a plethora of supporting roles, from informers to petty hoods, from veteran detectives to tyros. The performances of the character actors stand out, and they do what their fellows often do, elevate a film as a whole through their work. The main characters are well formed, too, and well-acted, but the secondary roles are the more memorable. The plot, as I implied, is complicated, but not quite unnecessarily so. 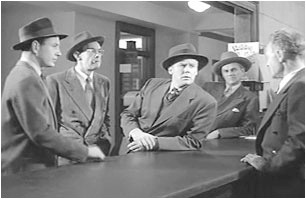 The script includes a great deal of slang, some shared by the police and the criminals, due to their common milieu. We hear of ‘lobos’ and ‘gungs’, and learn that the verb ‘to hang’ meant the same in the late 1940s U.S. as it does now: a certain coffee shop is where thieves and robbers ‘hang’. ‘To nick’ someone meant to arrest him; interestingly, the same as it did in Britain, at least into the 1980s. It has faded from American criminal slang, however. The climax is violent but short, and the denouement demonstrates that even then the detectives hadn’t deduced all of the plot’s twists. 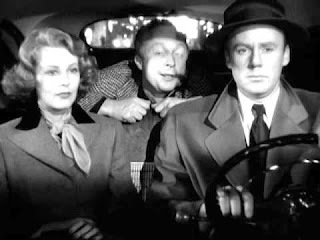 But that adds another element to Scene of the Crime, a hard-edged police drama with plenty of wrong-doing to satisfy the black-and-white cops-and-robbers enthusiast. Pleasantly weird footnote to this movie: John Bartlow Martin, who wrote the story "Scene" was based on, went on to become a speechwriter for Adlai Stevenson, and continued to be active in Democrat party politics during the 1960s. A varied career, to be sure. It makes me wonder how he made the jump from one type of writing to the other - or perhaps he was indulging in both all along. I wonder how much speech-writing paid (or pays)?